Discussion Where have you found Tux or the Linux Logo? Where have you found Tux or the Linux Logo? This discussion is more of a scavenger hunt for the community, please post picturess or videos of various unexpected locations and advertisements that you have seen Tux (the Linux Mascot) or the Linux logo. 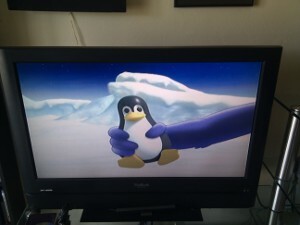 As detailed in my [ur="http://www.linux.com/community/blogs/tux-in-a-fruit-loops-commerical.html#readmore"l]blog post[/url] I had noticed that the animators in a Fruit Loops commercial decided to use Tux for a few seconds. You can checkout my blog post to find a link to a video someone made of the commercial. Yeah I saw this. Like I said, weird.